UBC Okanagan’s courtyard is where pomp and circumstance meet shouts of joy and colourful festivities as hundreds of freshly-minted graduates celebrate their accomplishments at the university’s convocation ceremonies. In five different ceremonies held over two days more than 1,600 students—the largest graduating class ever—were conferred their undergraduate, master’s and doctoral degrees. UBC Chancellor Lindsay Gordon told graduates they are part of a special cohort—the final group of the 2016 centennial graduates. 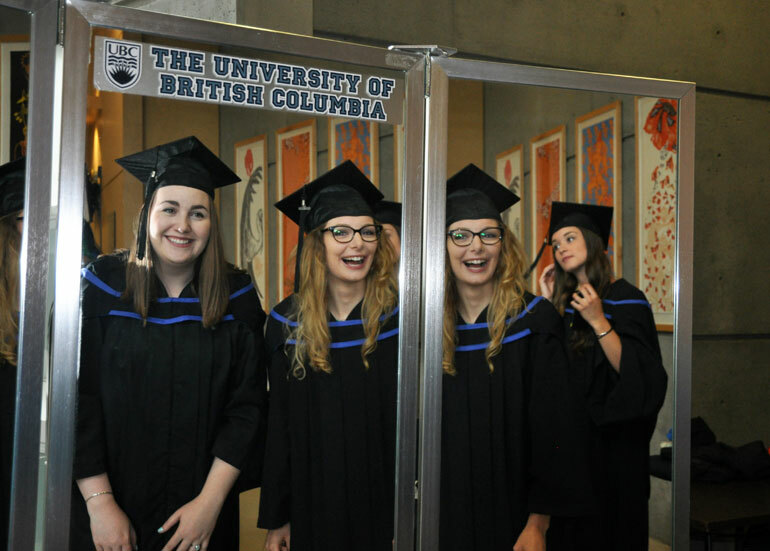 In 1916, UBC graduated 40 students; 100 years later there are more than 300,000 UBC alumni. 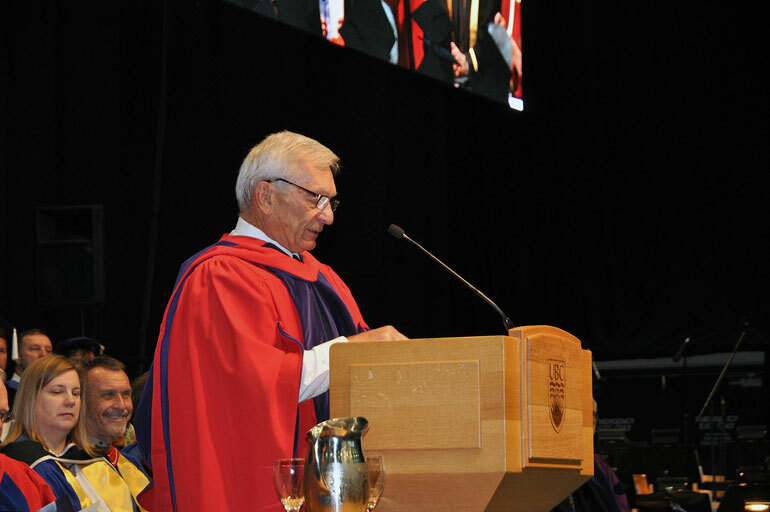 During the five convocation ceremonies, UBC conferred two honorary degrees. Dr. Roberta Bondar, Canada’s first female astronaut, and water scientist David Schindler were both recognized with an honorary Doctor of Science degree. Bondar also gave the graduating students advice as they begin their new careers or head to graduate school. She warned students of roadblocks they might face, mentioning several that she endured including falling ill while training to get into flight school. Bondar shared “pearls of wisdom” telling the graduates that they need passion and purpose to reach their goals. No matter what career path they follow, Bondar said, they must execute a plan for success, to always be well prepared, recognize opportunities, have the courage to act on those opportunities and expect the hurdles and setbacks. During Friday’s ceremony, Schindler gave the students a challenge. Speaking to a class of science graduates, he spoke of global warming, past world wars, acid rain, and environmental concerns and disasters of past decades. He commended Canada for being a leader in the past, but warned that without strong leadership, and science-based policy decisions, Canada will lose its ground on the world stage. This year, to mark the honour of the 2016 centennial graduates, each student was given a small stone as they left the ceremony. UBC Deputy Vice-Chancellor and Principal of the Okanagan campus Deborah Buszard explained decorative stones represent stones that were tossed in a cairn by students in 1922 when they marched demanding a new campus be built. The cairn remains a monument today at UBC’s Vancouver campus. 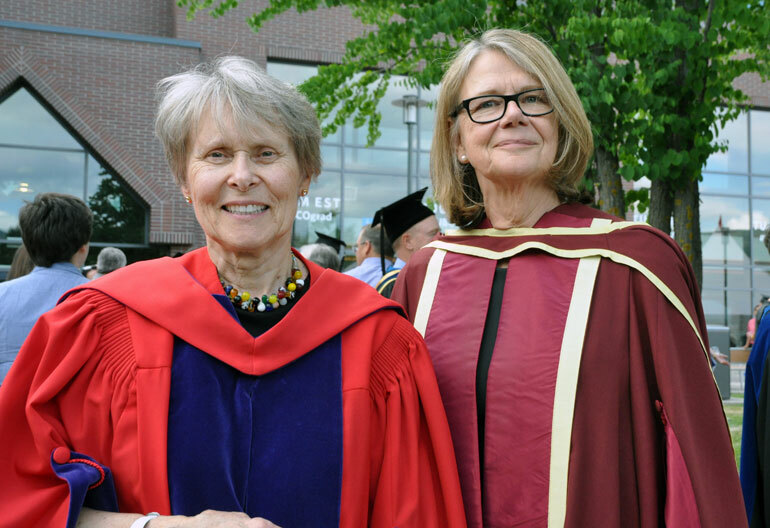 Dr. Roberta Bondar and UBC Deputy Vice-Chancellor and Principal of the Okanagan campus Deborah Buszard pose together after Thursday’s ceremony.